The Superman Fan Podcast: Episode #386 Part I: Superman Family Comic Book Cover Dated September 1965: Superman's Pal Jimmy Olsen #87! I'm glad to hear your coverage of the second part of the story begun in Superman's Pal Jimmy Olsen #86, "The Team of Brainiac & Olsen". There was a lot of Silver Age strangeness and plot holes in "The Arena of Doom", but it was a fun story, overall. As you noted, at a certain point in the story, the reader begins to understand that Superman is stalling for time, and must have some plan, but I certainly wouldn't have guessed exactly what that was. I very well remember from my boyhood reading of this story when Superman finally found out that Brainiac was not an organic being, but a "living computer". That realization would change their relationship for the rest of their history, and it was fun that Superman had finally "caught up" to knowledge that we readers had learned earlier. "Bizarro-Jimmy, Rock 'n' Roll Star", from the perspective of adulthood, is a funny look at how the DC "establishment" viewed Rock 'n' Roll in those early days. I remember Hullabaloo, Shindig, and, of course, American Bandstand, which was a daily, local TV show in Philadelphia (where I grew up) in my early youth, with local teens featured as dancers, before it changed to Saturdays and moved to Los Angeles. I'm more a fan of the original Bizarro as a tragic figure, rather than the Bizarro World full of Bizarro duplicates of all of Superman's friends, who were more figures of fun than tragic, but, in small doses, this kind of story can be fun, and this one fit that bill. Thanks for starting off the new year with episodes close together, but don't burn yourself out. 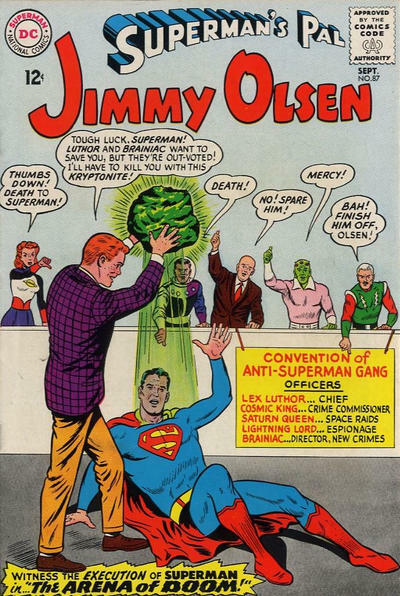 "Jimmy Olsen's Future Scoops" reminded me of how often head trauma was used in comics in those days, from frequent amnesia to generating temporary super powers. I hope these stories didn't lead too many kids to concuss each other in the search for adventure. Thanks for your comment. I agree with you that the earliest Bizarro stories were the best, especially when he threatened to invade Earth with an army of Super-Bizarros. Don't worry about me burning out. I just wanted to catch up to keep on pace for 52 weekly episodes.